I have the issue while maximized, windowed. Title bar text is crisp and clear but the UI in the game is fuzzy. (edit October 18, 2017) Fuzzy UI bug was introduced and identified via bug report. (edit April 11th, 2018 - 175 days later) Fuzzy UI still exists as of this patch. (edit April 24th, 2018 - 188 days later) Not fixed yet. (edit May 8th, 2018 - 202 days later) Not fixed yet. (edit October 25th, 2018 - 372 days later) Not fixed yet. (edit November 13th, 2018 - 391 days later) Not fixed yet. (edit November 27th, 2018 - 405 days later) Not fixed yet. (edit December 12, 2018 - 420 days later) Not fixed yet. (edit January 8, 2019 - 447 days later) Not fixed yet. I submitted another bug report about the fuzzy UI issue a couple months ago, since it still persists. 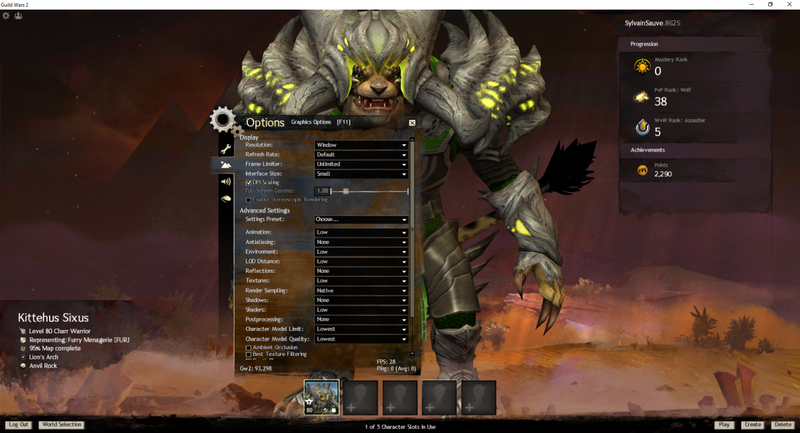 Please Anet, can you update players on whether this issue might ever be fixed? Or if any progress has been made at all? I'm honestly not trying to sound ungrateful but it's been almost a year and a half, and some word one way or another would very much be appreciated. I understand it's not a big deal to players not affected, but if you are affected, it makes the game exponentially more difficult (and painful) to play when you can't focus properly on anything textual.